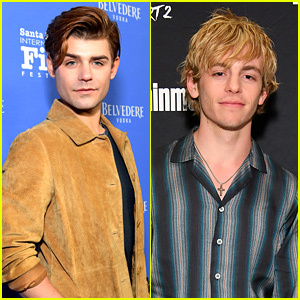 Jimmy Kimmel Photos, News, and Videos | Just Jared Jr.
Katie Stevens Knew About Fiance Paul DiGiovanni When She Was 14! Katie Stevens first learned about her fiance Paul DiGiovanni when she was 14 years old! The Bold Type star flashed a grin while visiting Jimmy Kimmel Live! on Tuesday (April 16) in Hollywood. 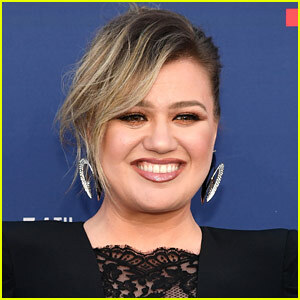 She discussed Jimmy “jinxing” her when she was a contestant on American Idol, her engagement to Boys Like Girls musician Paul DiGiovanni, her bachelorette party at Disney World, her bridal shower (where she opened an awkward gift in front of her parents), and her Freeform series. Watch the video to hear what she had to say! FYI: Katie is carrying Vince Camuto bag while heading into the studio. Joey King Opens Up About Being a Maid of Honor at Her Sister's Upcoming Wedding - Watch! Joey King is so excited for her sister’s upcoming nuptials! The 19-year-old The Act star appeared on Jimmy Kimmel Live on Wednesday evening (March 20). During her appearance, Joey talked about getting her start in the industry and doing commercials since she was a four year old, as well as her very embarrassing accident while wearing a new pair of Heelys. She also talked about her family living in her house, as well as being the maid of honor at her sister Hunter‘s wedding. Plus, Joey reveals the item she stole from the set of The Act. FYI: Joey is wearing an Adeam suit, a Wolford shirt, Oscar Tiye shoes, Melinda Maria earrings, and a Graziela Gems ear cuff and rings. Miley Cyrus Explains to Jimmy Kimmel That 'Nothing Breaks Like a Heart' Is a Simile! Miley Cyrus is here to make sure that fans, like talk show host Jimmy Kimmel, don’t take her song “Nothing Breaks Like a Heart” too literally. Jimmy decided to prove to Miley and collaborator Mark Ronson that things can break like a heart, so he destroyed things like a lamp, glasses, and a television screen. Jimmy even took Mark and Miley to a souvenir store in Hollywood where they trashed the place, throwing snowglobes, mugs, and more to the ground. “You’re taking it too literal. The song is not supposed to be literal. It’s a simile!” Miley later explained. Glen Powell Explains Why He Sent His Monkey to Jail - Watch! Glen Powell is explaining some monkey business! 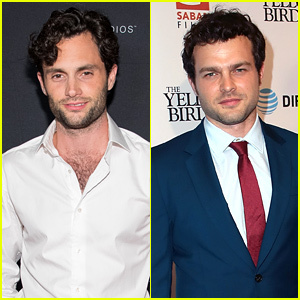 The 29-year-old Set It Up actor made an appearance on Jimmy Kimmel Live on Wednesday (June 13). During his appearance, Glen talked about putting his monkey Charlie in jail because it bit someone’s finger – and also about his kangaroo that wears diapers! He also talked about Set It Up, and premiered a clip of his real grandma doing some not-so-subtle acting during the movie. Watch Glen‘s appearance on Jimmy Kimmel Live below! 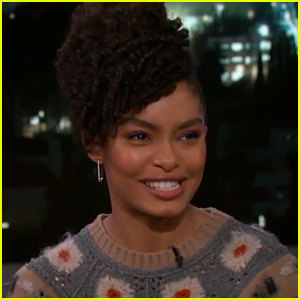 Yara Shahidi Opens Up About Heading Off to Harvard - Watch Now! Yara Shahidi is getting ready to head to Harvard University! The 18-year-old Grown-ish star made an appearance on Jimmy Kimmel Live on Monday night (March 12). Yara discussed how she’s still working to figure out how to balance filming Black-ish and spin-off Grown-ish and attend school. Yara also discussed growing up around music, including the fact that her dad was Prince‘s personal photographer, as well as working with Eddie Murphy. “It wasn’t until I got older until I realized just how unique my childhood was,” she explained. There’s even a signed photo from Yara to Prince on display at Paisley Park! FYI: Yara is wearing a full Alberta Ferretti look. Maisie Williams Knows the 'Game Of Thrones' Ending Already - Watch! Maisie Williams has the Game Of Thrones scoop! The 20-year-old star made an appearance on Jimmy Kimmel Live on Wednesday (February 21). During her appearance, Maisie talked to Jimmy about the highly-anticipated end of Game of Thrones, which is set to return in 2019, and revealed where she was when she read the final script. She also addressed the report that the cast was shooting alternate endings to the show, and also talked about making her new claymation film, Early Man.